Mayan civilisation was scattered throughout the Mesoamerican region and over the course of thousands of years many independent and powerful city states thrived. These city states were often hostile to each other and thus a constant state of warfare existed in the Classic Period of the civilisation. This warfare also became one of the most important reasons for the downfall of the Mayan civilisation. One of the most important cities of the Classic Period that survived into the Post-Classic Period was Chichen Itza. Eventually the city also faced its downfall during the Late Post-Classic period. Chichen Itza Mayan ruins are among the most important Mayan ruins in the region and provide valuable insight into Mayan history and culture. Chichen Itza was located in the Northern Maya Lowlands and acquired the status of importance during the Late Classic Period (600AD-900AD). It remained an important and powerful urban centre during the Terminal Classic (800AD-900AD) and the early Post-Classic Period (900AD-1200AD). 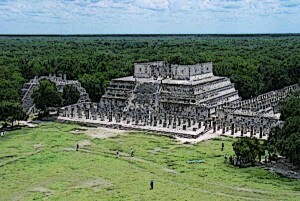 The city eventually faced its decline after it was conquered by the emerging power, Mayapan, although it is thought that the city was not plundered or sacked and the population continued to live there. Modern excavations of the site began in late 19th century. The Temple of Kukulkan, also known as El Castillo, is easily the most important Mayan building at the Chichen Itza Mayan ruins. This is a stepped pyramid which is about 30 meters high and has nine square terraces, with each terrace approximately 2.57 meter high. Other than the main pyramid structure, there is a six feet high temple upon the summit. The pyramid rises at an angle of 53 degrees with the four stairways rising at an angle of 45 degrees. A Chac Mool status stands inside the temple at the top of the pyramid, along with a throne in the shape of a jaguar. A very famous tourist attraction at Chichen Itza Mayan ruins is the Great Ball Court. This is not the only ball court in Chichen Itza and so far 13 ball courts have been identified. Nonetheless, the Great Ball Court is by far the largest and most impressive, having measurements of 168 by 70 meters. At one end of the court is located the North Temple which is also known as The Temple of the Bearded Man. There is very fine bas relief carving on the inner walls of the temple. There is another temple at the southern end but is it in ruins. There are various platforms at Chichen Itza Mayan ruins reserved for different purposes. One such platform is the skull platform where the skulls of sacrificed people were impaled vertically. Another platform, located immediately to the east of the Great Ball-court, is called the Platform of the Eagles and the Jaguars. This platform is built in both Mayan and Toltec styles and has four staircases for four sides. Each side is decorated with panels showing eagles and jaguars eating human hearts. Another platform is called the Platform of Venus, dedicated to planet Venus. An important site at Chichen Itza Mayan ruins is the Temple of Warriors. This is a large complex consisting of a large stepped pyramid at its front along with rows of carved columns depicting warriors. A similar temple is found in the Toltec capital of Tula which points towards a cultural contact between the two civilizations. But the temple at Chichen Itza is considerably larger in size and also houses a Chac Mool at the top of its stairway. The temple is built over another structure, a common practice in Mesoamerica, called the Temple of the Chac Mool. Another noteworthy location at Chichen Itza Mayan ruins is the Group of a Thousand Columns which once supported an extensive roof system. These columns are divided into three distinct groups of sections called the west group, the north group, and the northeast group. The west group extends the lines of the front of the Temple of Warriors. Along the south wall of the Temple of Warriors runs the north group which contains pillars with carvings of soldiers in bas-relief. Finally, the northeast group is located at the southeastern corner of the Temple of Warriors and consists of a small temple with a variety of carvings of humans, gods, and animals. Two more notable structures at Chichen Itza Maya Ruins are Las Monjas and El Caracol. Las Monjas is a complex consisting of buildings from the Terminal Classic Period built in Puuc architectural style. This place is thought to have been used for government work. There is also a small temple here which is decorated with elaborate masks. El Caracol is said to have been an observatory, judging from its round shape and unusual placement on the platform. Further, the doors and windows of this building are aligned to astronomical events particularly the path of Venus across the sky. There are also various other notable structures at Chichen Itza Maya ruins, within a square of 5 kilometres. For instance, there is a group of structures known as “Old Chichen” located to the south of the central site. This group includes the Phallic Temple, the Platform of the Great Turtle, the Temple of the Owls, and the Temple of the Monkeys. About 4 kilometres southeast of the main archaeological zone there is a network of sacred caves known as Balamka’anche’ which house a large section of ancient pottery and idols. At its height, the Mayan civilisation had many city states with thriving populations and impressive architecture. One such city was Chichen Itza which was an important and powerful urban centre not only during the Classic Period but also during the Early Post-Classic Period. Today, Chichen Itza Maya ruins is the site of some of the most important ancient Mayan buildings including various pyramid temples, government buildings, platforms, and other kinds of structures which have been categorised into different groups. The site provides valuable information about the history and culture of Mayan civilisation.